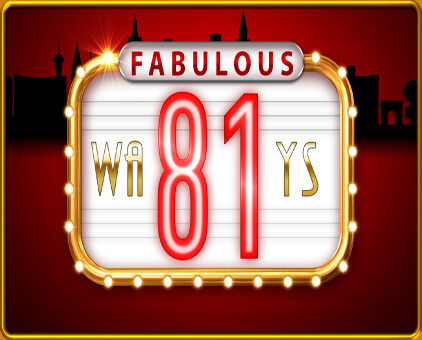 Fabulous 81 – APEX pro gaming a.s.
Fabulous 81 is a 81 lines, 4 reels / 3 rows video game. 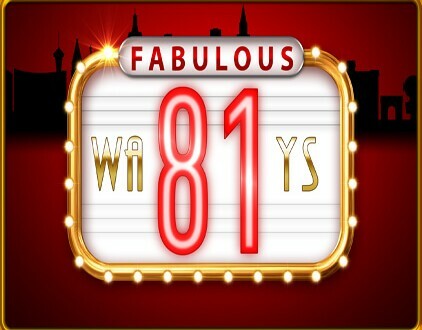 The Top Award is 160 credits multiplied by the number of total credits bet. 1) The game is played on 81 lines fixed. 2) JOKER substitutes for all symbols. 3) JOKER appears on at most 3 reels. 4) JOKER never appears on the 1st, 2nd and 3rd reel at the same time. 6) All symbols pay scattered. 7) All combinations start at the leftmost reel. 8) All wins are multiplied by total credits bet. 9) Malfunction voids all pays and plays. Every win gives the player an option to enter the Gamble Feature by pressing the GAMBLE button on the screen. The appearance of the GAMBLE button will follow each win. The Gamble Feature is Card Color (Red or Black), guessing Game. A correct guess doubles the win. Doubling the win is possible up to 5 times or until the Gamble Limit is reached. If the wrong color is guessed, the Gamble Feature is over. All the time during Gamble Feature the player has an option to collect the win and return to the Main Game.